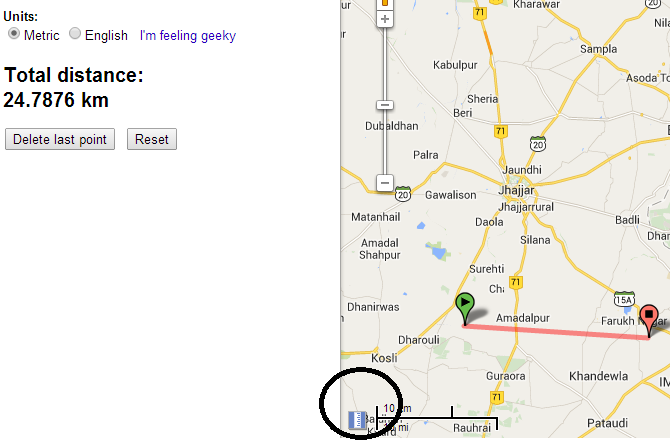 Measure Straight line distance in Google Map between two points. Straight line distance can be calculated with Haversine distance formula or Great circle distance formula. Google Map, a web mapping service application and technology, which provides and enrich a common user experience for free, like, Route planner for traveling by foot, car or public transportation with estimated travel time, Congestion description on current time or with prediction time, measure distance from one place to other either straight or route wise, see near by location and many more. You can easily calculate straight line distance measurement, by just following simple steps. Note: Google provides two different version of map as, Classic Google Map (now with new Google Map Lite mode version) and a newly customized Google map. For both version, different steps are to followed to calculate distance. Below are the methods for both. 1.) Open Google Map in your browser. 2.) Right click, from your starting point on Map, and select Measure Distance options. 3.) Click on destination point to which you want to measure distance. Done. 4.) 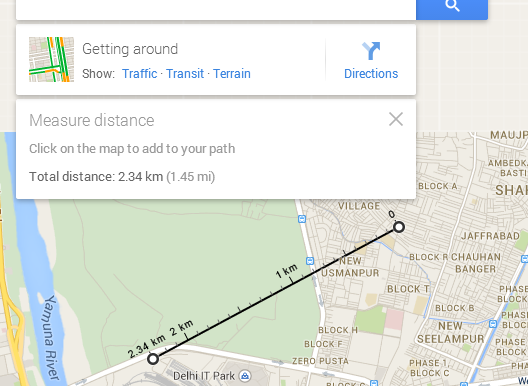 Under the search box, see the calculated distance, as shown below in the figure. 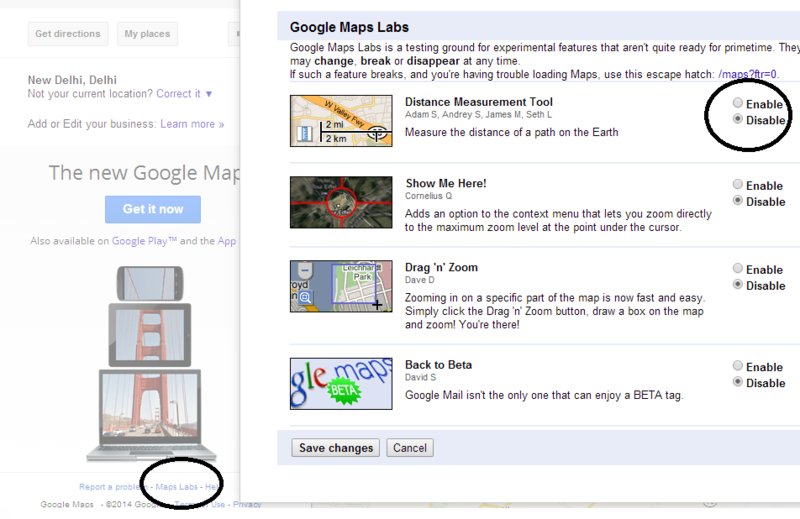 How to switch between Google classic map and Google new map. Now switch to Lite Mode Google Map version. 1.) Open Google map in your browser, and login with your Google all in one account. 2.) Click on Map lab link, appearing just left bottom panel. 3.) Enable “Distance Measurement tool”, and save changes. 4.) Click on ruler icon which appear at the lower left hand corner of map. 5.) Click on your start point and the end point, this will give your straight line measurement, shown in the left panel as shown. Get current traffic and traffic prediction near you or at other place. 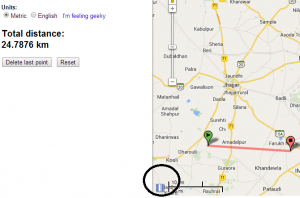 Get nearby place with keyword search on Google map. Hope this article helped you, to measure straight line distance, between two points. Do comment, below with your experience to calculate distance on Google Map. I have reported this to Google, since thier Help does say this is the process. Also this article is not dated. Blogging 101 – All articles should be dated, since things change over time. Your Google Map must be in lite mode. Please try to switch back to full mode. Try this link and then follow the above steps: https://www.google.co.in/maps/preview/?source=tldsi&hl=en . You must also see difference between Lite mode and Full mode of Google Maps from here: http://www.igismap.com/switch-to-google-map-lite-mode-replace-classic-map-improved-speed/. Hope this might help you.